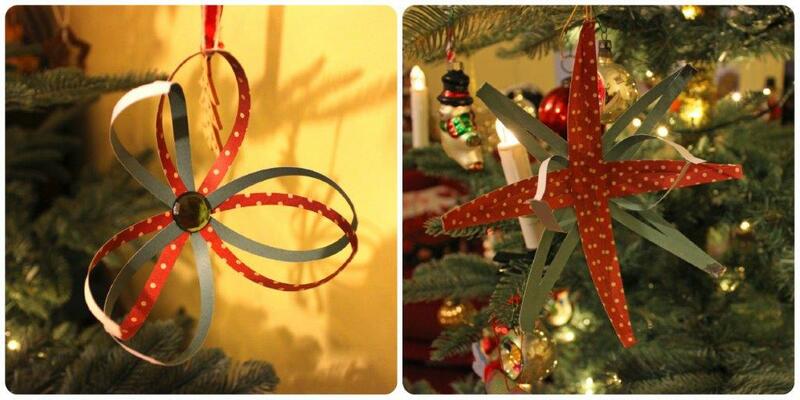 With Christmas so nearby you’d be forgiven for thinking that time had run out for crafting but today I’ll show you how to make some quick and Easy Paper Decorations for Christmas. 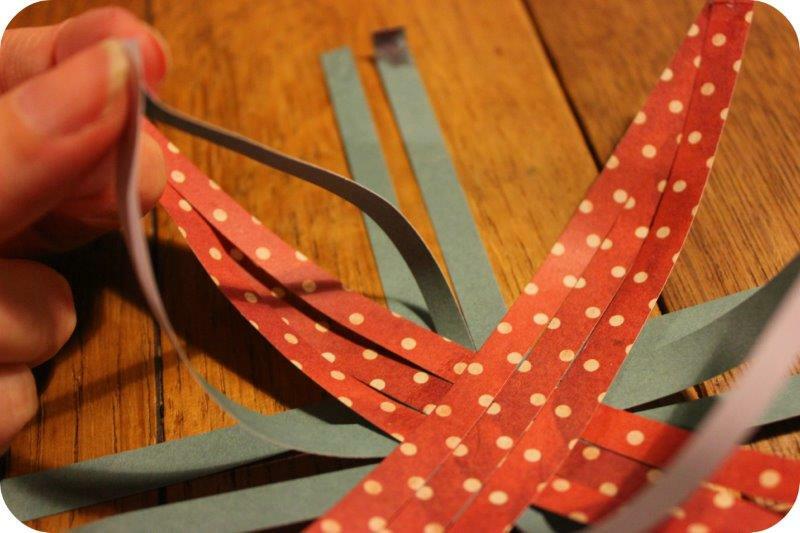 They’re also the perfect craft to keep the kids busy now that the Winter holiday looms! 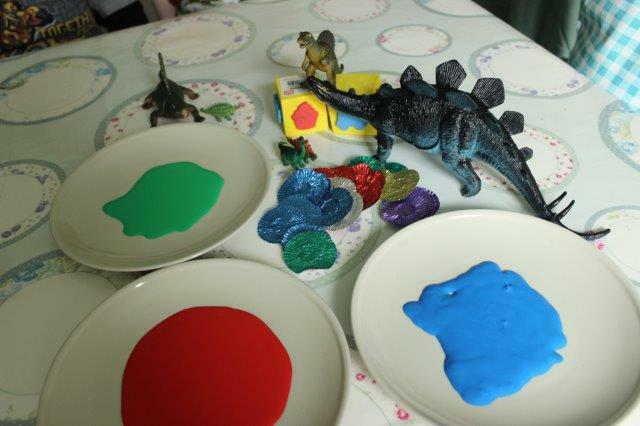 All the supplies were given to me by Bostik as part of their craft ambassador program. 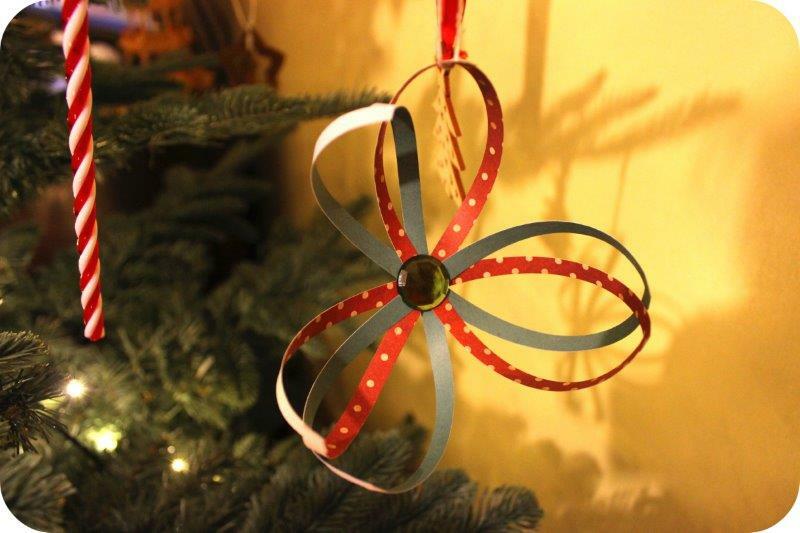 This is the simplest of my two decorations and super quick! 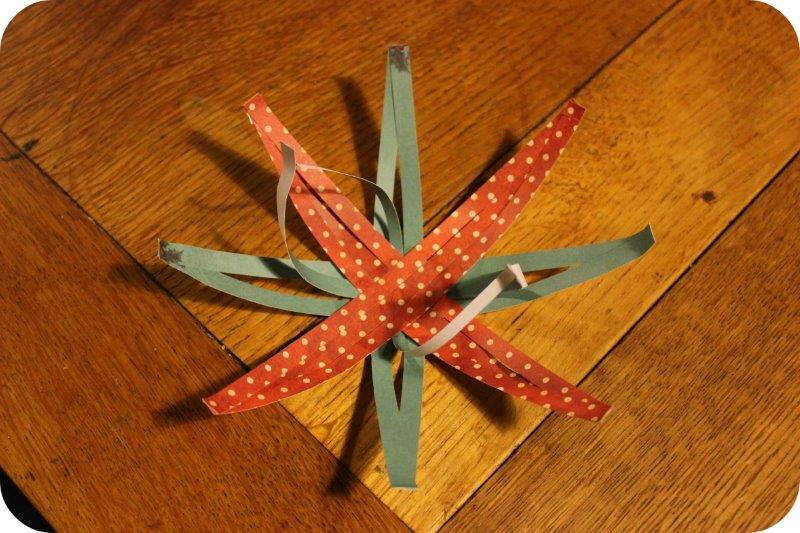 Start by laying strips of paper over each other to form a cross, keep laying until you have a star shape made of 6 strips of paper (3 of each colour). Using the fine and wide glu pen stick together two opposite strips of paper (see pic). Continue until all the red strips have been stuck together to make three petals. Repeat with the green strips of paper. 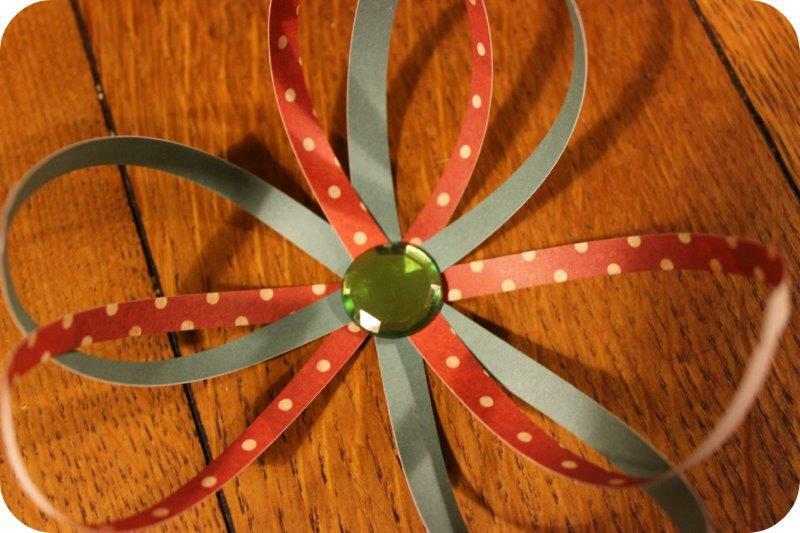 Glue a gem into the centre of the flower, tie on some thread and you’re done! A variation on the same theme but a little more involved. 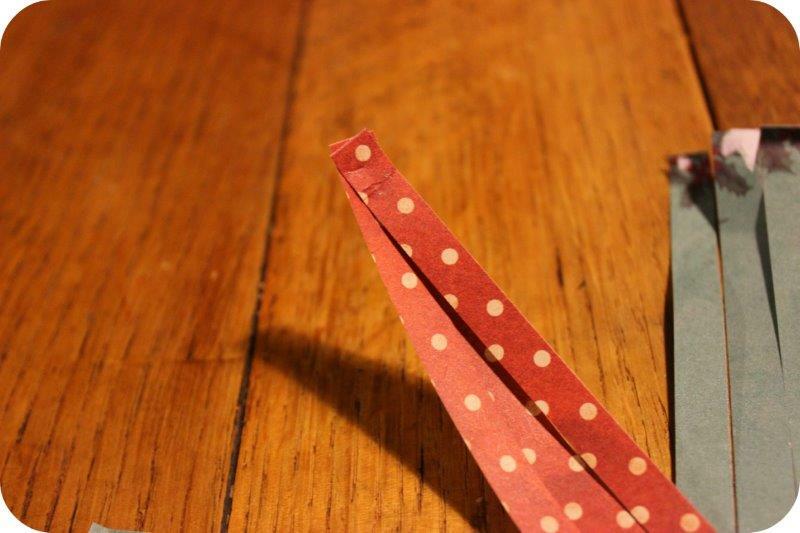 Start by laying 3 strips of paper side by side. Pop a little glue in the centre of the strips and then lay 3 more strips at right angles to make a cross shape. Continue laying 3 strips until you have a star shape. Stick together the 3 strips of red paper, they should curl slightly towards the centre. Repeat on each branch of red paper. 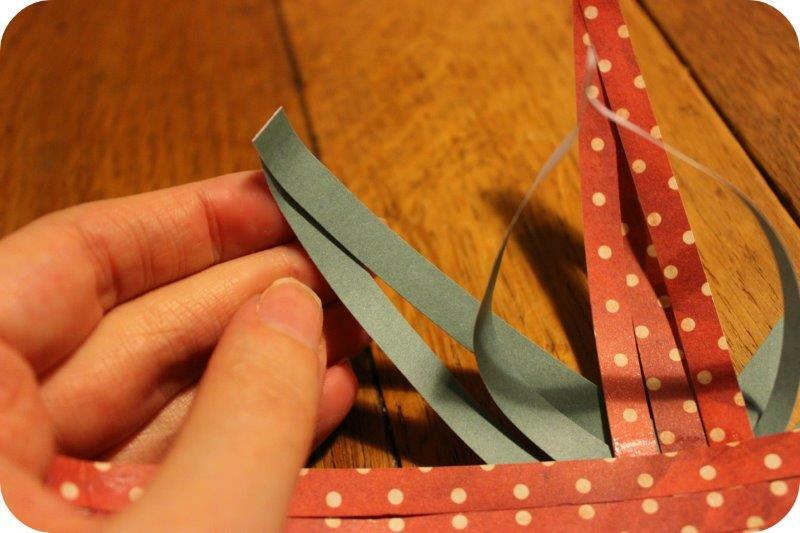 Take the centre piece from the green strips of paper and stick to the opposite strip as shown in this picture. Stick together the remaining 2 strips of green paper. 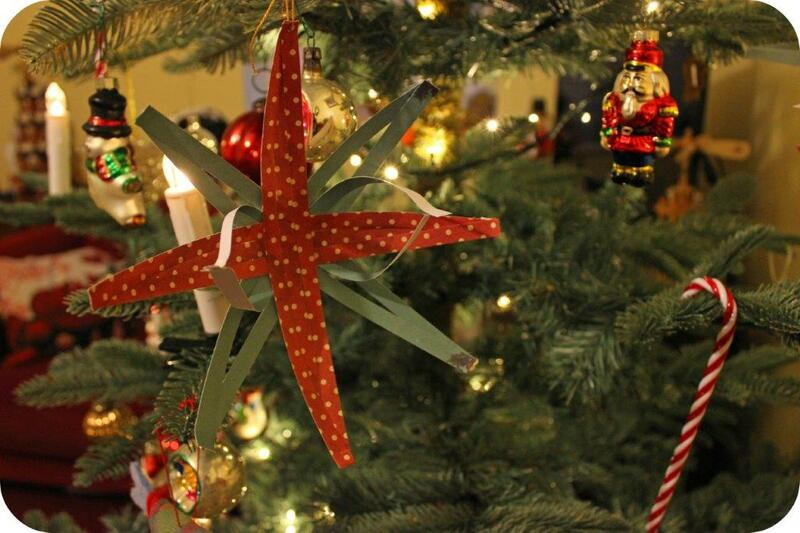 Attach some thread and enjoy your new decorations! Wrapping up your carefully selected Christmas presents can often be a bit of an afterthought and that’s before you even think about the added cost of ribbons and bows. 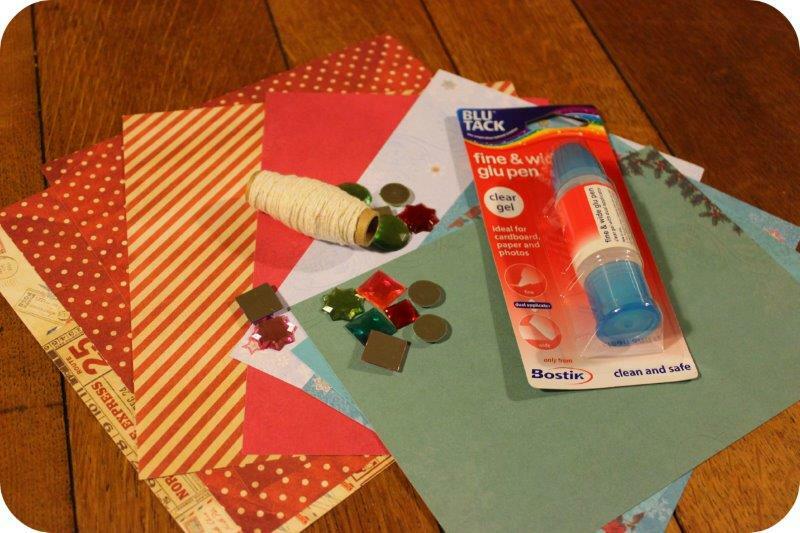 This year how about making your own gorgeous wrapping paper for a fraction of the cost. 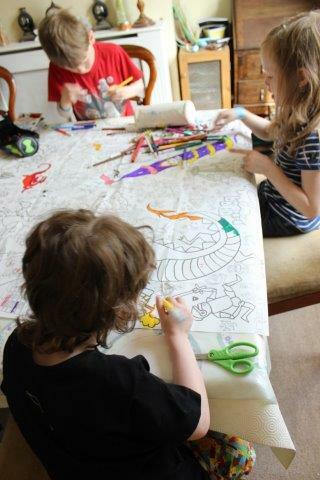 It’s the perfect craft for adults and children alike and the end result is really only limited by your imagination. Grab an apron and protect your work surfaces then begin by cutting lengths of brown paper and laying onto a table. Note. You may need to secure the corners if the paper starts rolling up. The exact design of your wrapping will depend upon your own preferences and whether this is a craft intended for adults or children. 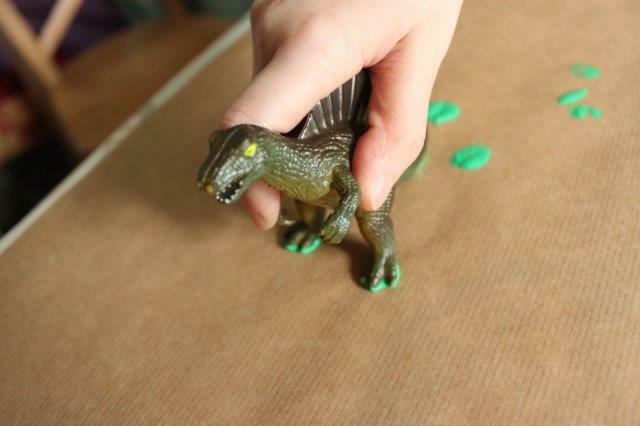 As my youngest has an impressive collection of plastic dinosaurs we decided these would make the perfect printing tools. Many household items make wonderful stamps. 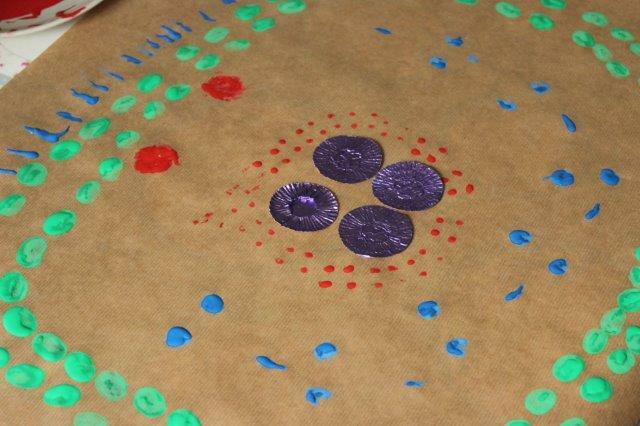 Pennies are great for rolling along their edge, old cotton bobbins make interesting circular shapes, even potatoes can be cut in half and a stamp carved out. As long as you’re using washable paint then it’s worth trying out a few things until you achieve an effect that you’re happy with. 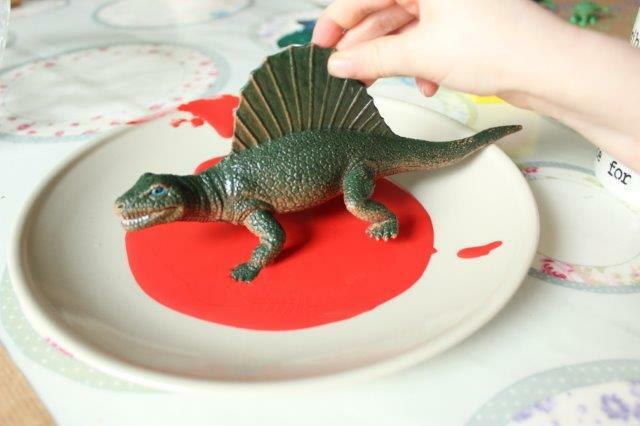 Squeeze some paint out onto some plates and then get dipping your stamps! We had dino footprints walking in tandem all over the place. 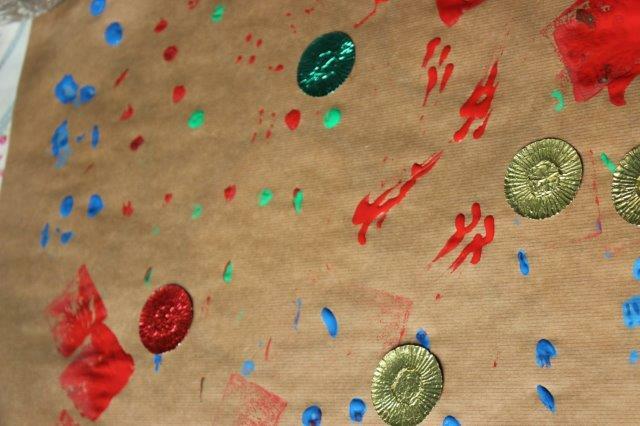 To add a bit of glitz we stuck clean sweetie wrappers onto our paper but glitter or stickers would also work well. Leave the paper to dry out completely. Now you should have some wonderful personalised paper that any recipient would be grateful to receive. It’s especially good for relatives who really appreciate the time and effort that’s involved. 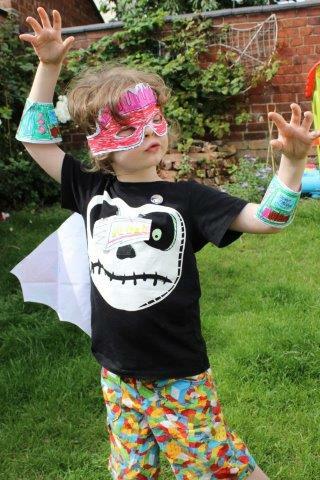 Eggnogg.co.uk create products that allow children to have fun and fuel their imagination. The brand is the inspiration of former TV graphic designer, Kate Edmunds, who became a full-time illustrator after the birth of her children. 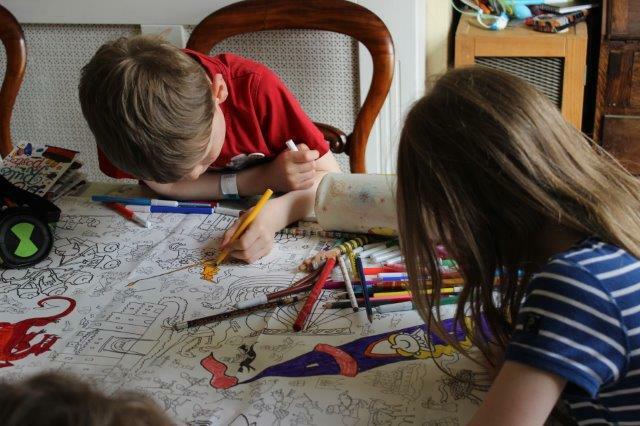 Greatly influenced by Tim Burton, Kate has always loved writing and illustrating her own children’s stories, conjuring up weird and wonderful characters. Her love of textiles is a bit of an obsession which she also incorporates into her designs. 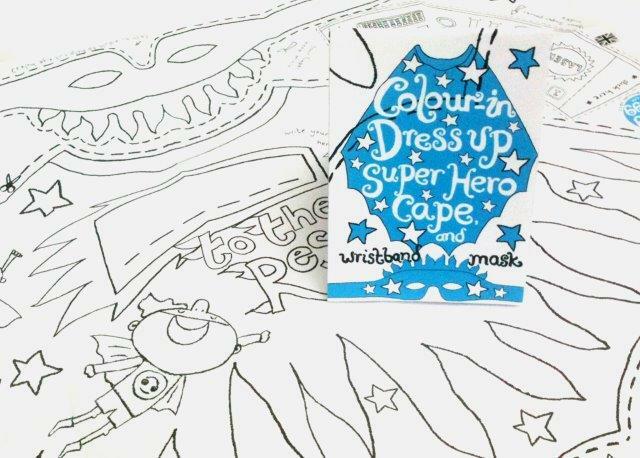 Eggnogg.co.uk has grown from developing a range of greeting cards to keeping little people busy with a unique range of colour-in products. The products have a no-nonsense attitude that both children and adults adore. The bold designs allow for scribbles to find their way between the lines, helping challenge the senses through colour, texture and humour. 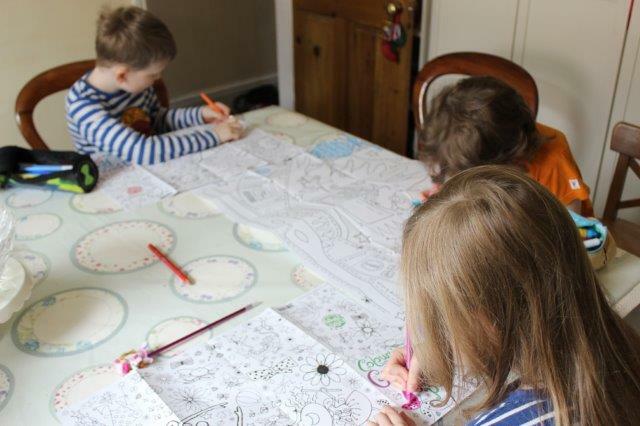 When I was first asked to review some Eggnogg products I had a bit of a mixed reaction, my kids love to colour and be creative but how can paper products hold up to the rigour of a child’s play? These posters retail at £4.99 for the two and I have to admit I think that’s overpriced. 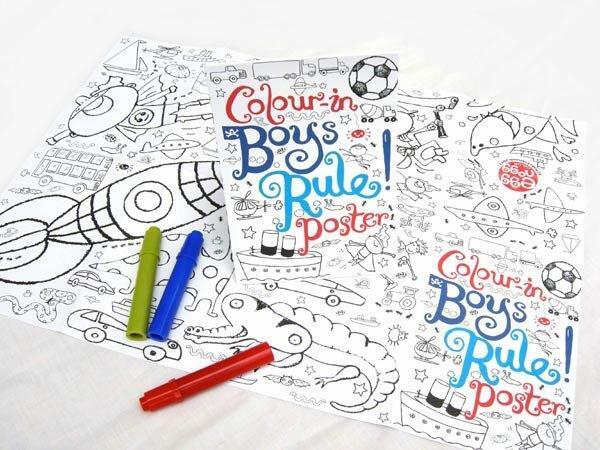 Don’t misunderstand me, my kids loved colouring in these posters and it kept them creatively occupied for quite a long time, however the price just seems too high. I have probably been influenced by the large quantity of free posters we have picked up from shopping centres, banks, national trust properties etc this summer. From free to nearly five pounds is a big leap. Each poster is just slightly larger than a3 size. 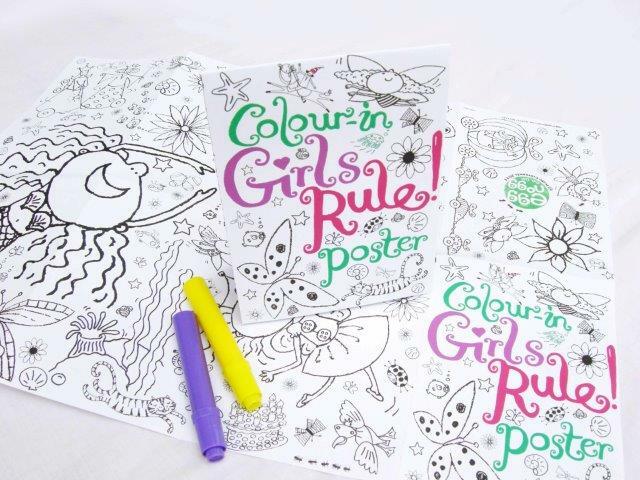 On a positive note they definitely keep children occupied and happy for quite sometime and the end result is worthy of displaying on their walls, so if the price doesn’t put you off then you’ll love this product. I have mixed feelings about this cape as well. 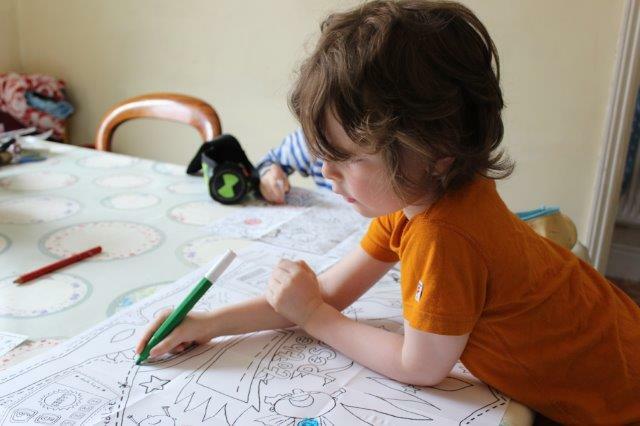 My youngest son was so excited when this arrived and enthusiastically began colouring. Unfortunately he has a short attention span when colouring and it took several sessions to finish, this meant the paper became a bit creased. When he finally had it on, he adored it! 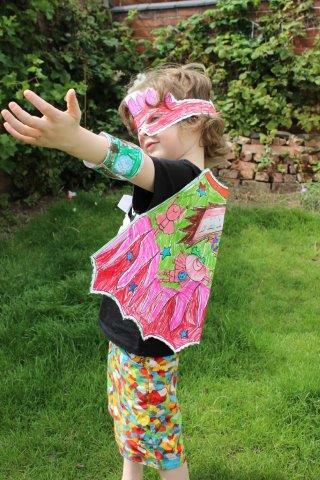 Then it fell off 🙁 The cape attaches using Velcro dots stuck to the paper and to your own clothing, the dots on clothing just didn’t seem happy to stay put. The mask and cuffs stayed in place as they were stuck together with selotape. So from a design point of view a fixing that was a little more reliable and able to cope with running, jumping and general play would be my preference, we ended up having to use safety pins. As a concept I think this is fabulous for little ones, be prepared for tears when it inevitably rips though. My son loved his cape and for that reason alone I would consider buying this item again. I saved the best until last! 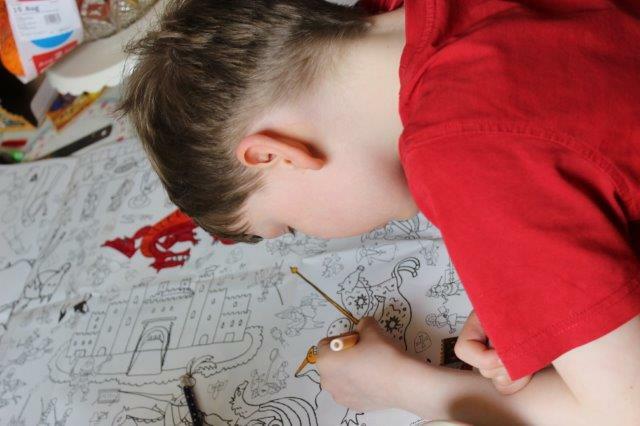 I love this item, it’s hours and hours of creative fun for the whole family and when you’re finished you could put it up on the wall if you don’t want to use it. We’ve still not finished this and it’s kept boredom at bay for quite a few days. 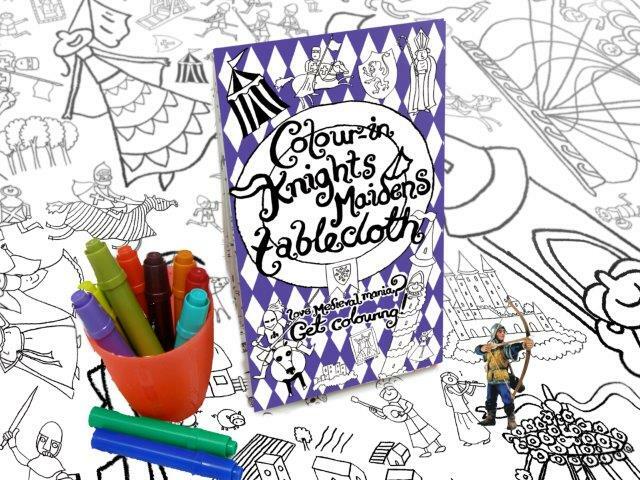 It’s perfect for lazy afternoons with the whole family scribbling away. I think the tablecloth would really come into it’s own at parties or family gatherings when there are several children you need to keep busy and out of trouble. I would most definitely buy another in such a situation. Would I recommend these items? Yes and No. I still believe that the posters are overpriced and I think the attachments for the cape aren’t the best, however the tablecloth gets a huge thumbs up! Personally I think the posters should be a free item when you spend X amount on other products. I think the cape needs better attachments to make it more secure. Comments Off on Eggnogg Colouring Review!